Feeling overwhelmed with how to start introducing solid foods to your baby? We get it! Feeding your baby for the first time can be confusing and challenging. Clear the air and connect with a Registered Dietitian. You’ll get expert advice from dietitians who believe that babies can feed themselves from the start. The Baby Led Weaning approach is a natural way to offer your baby foods and to raise happy, independent eaters. We give parents peace of mind by providing nutrition support and advice for the transition from milk to solids. 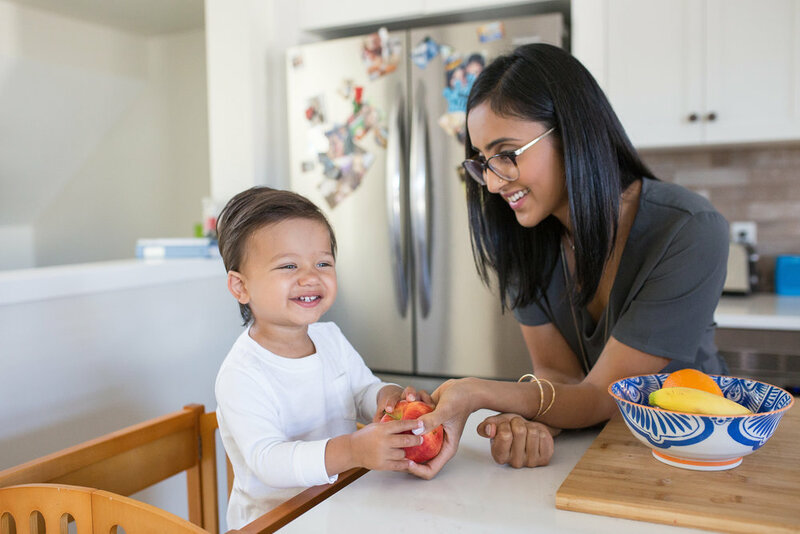 We teach parents just like you how to successfully establish positive feeding behaviours and put your mind to ease by answering all of your questions about how to safely feed your baby. This is a 2 hour session which takes place in your home or at our office location. It is billed at $250.00. *Note: If you have extended medical health benefits, your baby led weaning session may be covered, and we may be able to direct bill your nutrition appointment for you. To see if your session would be covered, please contact us. How can I manage an allergic response to particular foods? Is dairy safe for my baby? When can I introduce it? Which foods should I introduce first? How do I offer my baby meats? Is BLW appropriate for a vegan or vegetarian baby?